The Conseil Européen pour la Recherche Nucléaire, or CERN as it is more popularly known, is hardly something that most people associate with the art world. Despite being in the news quite a bit recently thanks to their apparent discovery of the Higgs Boson subatomic particle, the so-called 'God particle' (though only named so because publishers didn't want to call it the 'Goddamn particle', as Higgs originally intended), they actually have an unexpected connection to the arts and artists that has been far less publicised. Under the auspices of the aptly-named COLLIDE International Award, the organisation pairs together a scientist from the CERN project with an active artist from somewhere in world to work on a project showcasing the interconnections between science and art. The winner receives a $15,000 cash prize and a three-month long residence split between the CERN labs that host the Large Hadron Collider and the Foundation for Art and Creative Technology (aka FACT), which is based in Liverpool. "Our desire is to connect the worlds of leading scientists with international artists through 'creative collisions', encouraging both fields to inspire and challenge each other, and pushing the boundaries of their traditional roles and methodologies," explained Monica Bello, the director of the Arts@CERN program. Typically, artists tend to regard scientists as overly literally-minded, and scientists are perceived to regard artists as directionless and frivolous, but there is much, much more to the story. “If I was forced to say something about how I imagined a lot of artists were, I would’ve said something to the effect that they are creators, they make things,” said Subodh Patil, a theoretical physicist who was paired with Bill Fontana, a sound artist, in 2013. “Bill had an almost explorer-like streak about him, which would have qualified him to be a scientist as well in another life." For those of you who may be interested in applying for this year's award, the application process is open until May 23, and the lucky and dedicated recipient will be announced sometime in June. 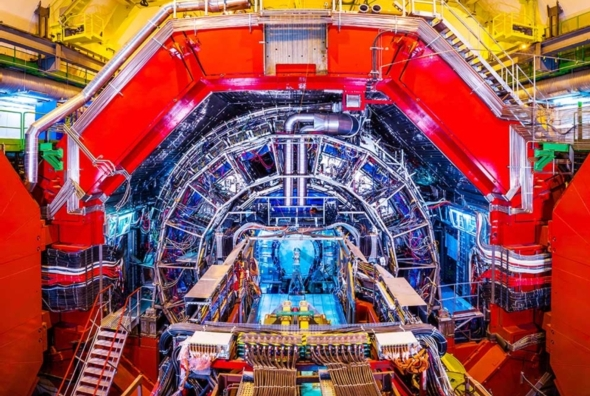 Interested applicants must speak English well enough to communicate at CERN, where it is the chosen common language, and be interested in pushing the boundaries of the traditionally understood intersections of art and science.